STEP ONE // First, I always moisturize with Charlotte Tilbury Magic Cream. Why I love it? As someone with normal skin and a slightly oily T zone, I find that thicker, non-oily creams work best on my face. The Charlotte Tilbury Magic cream is thick, non-oily, and a little goes a long way. This product seems to last and last! STEP TWO // Using my fingertips, I apply Charlotte Tilbury Flawless Filter (shade number 2) all over my face. Why I love it? I don’t like wearing heavy foundations, but do want something that evens out my skin and provides a thin layer of coverage. 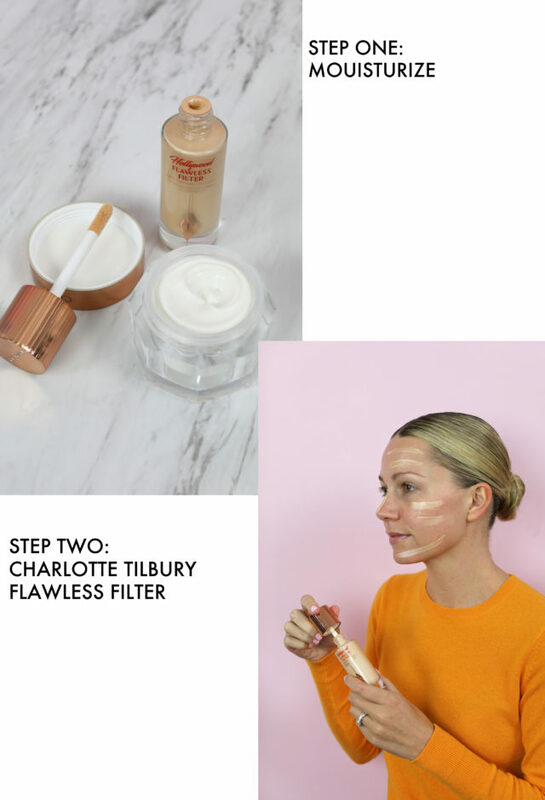 The Charlotte Tilbury Flawless filter achieves that while also creating an all over highlighter glow that leaves my skin looking and feeling dewy and fresh. This look may be a bit much for some, and I know several friends who use this product, but prefer it more sparingly and only on cheekbones, bridge of the nose, etc. 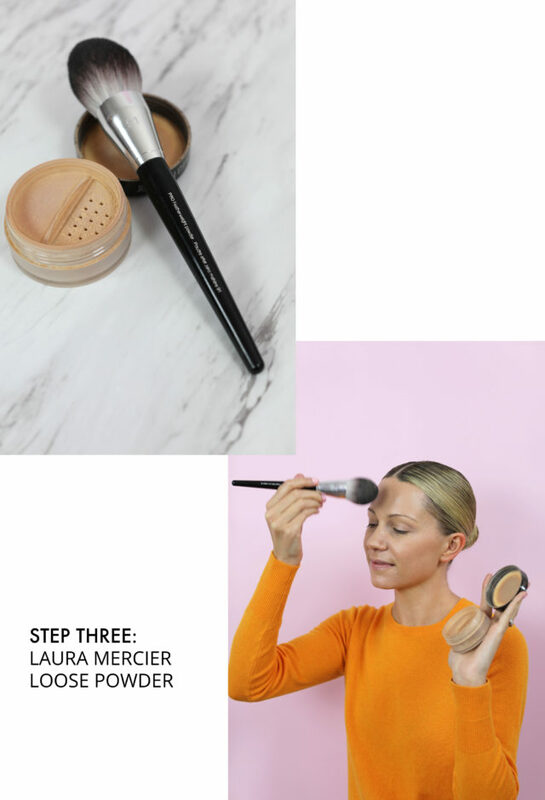 STEP THREE // Using a large featherweight powder brush I lightly apply a small amount of Laura Mercier Mineral Powder (shade ‘real sand’) all over, and in a circular, sweeping motion. Why I love it? This lightweight mineral powder helps to provide a bit of coverage, takes down the shine on my face ever so slightly, and sets my moisturizer and foundation for long days ahead. 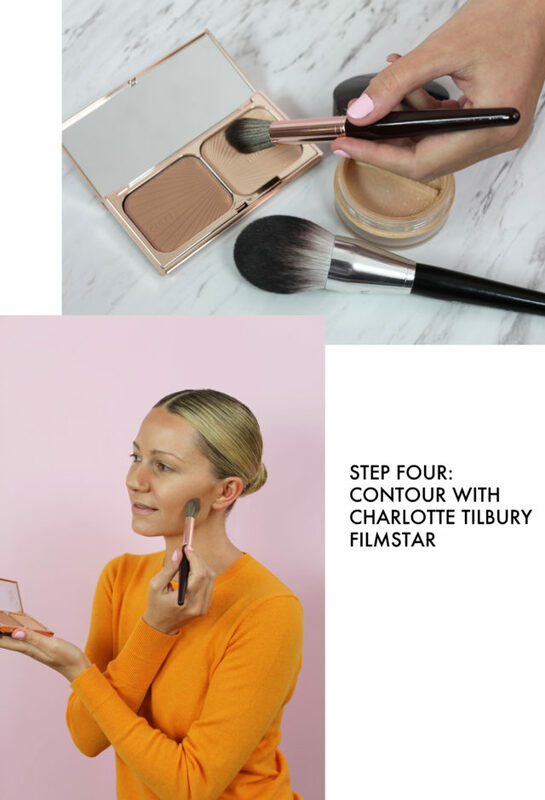 STEP FOUR // Next, I contour using a the Charlotte Tilbury Filmstar Duo. Using a sculpting brush I’ll apply the bronzer below my cheekbones, along the sides of my nose, and across the top of my forehead/hairline. I then apply the highlighter to my cheekbones, bridge of my nose, center of my forehead, temples, and center of my chin. Using a blending brush I then blend together so everything looks more natural. Why I love it? Contour can be hard and finding the right product can be super confusing. I found this product matched my skin tone perfectly, was easy to apply, and lasted throughout the day! 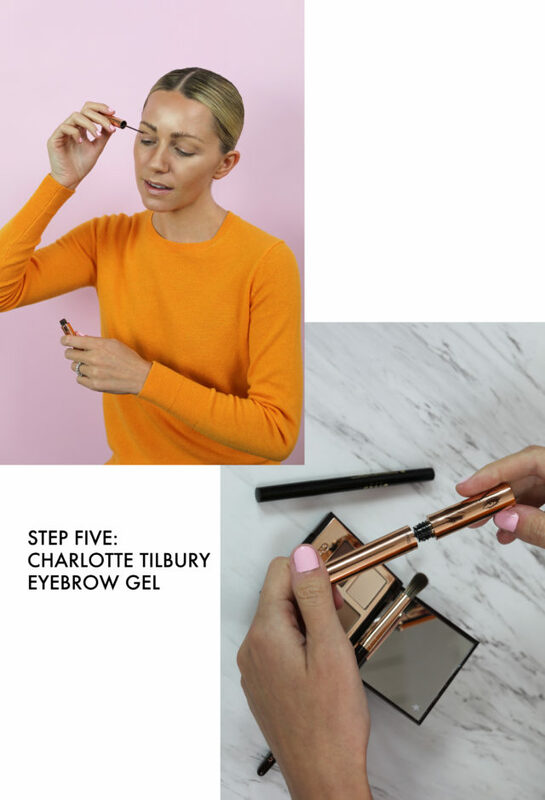 STEP FIVE // Using the Charlotte Tilbury Eyebrow Gel (shade ‘supermodel’) I brush the gel upward on my eyebrows to help darken them as well as give a fuller look. Why I love it? Having lighter brows, I have found filling in my eyebrows with a pencil looks too harsh and un-natural on me. This gel enables my brows to look fuller, darker, and more natural, all in a really easy and quick to apply step! 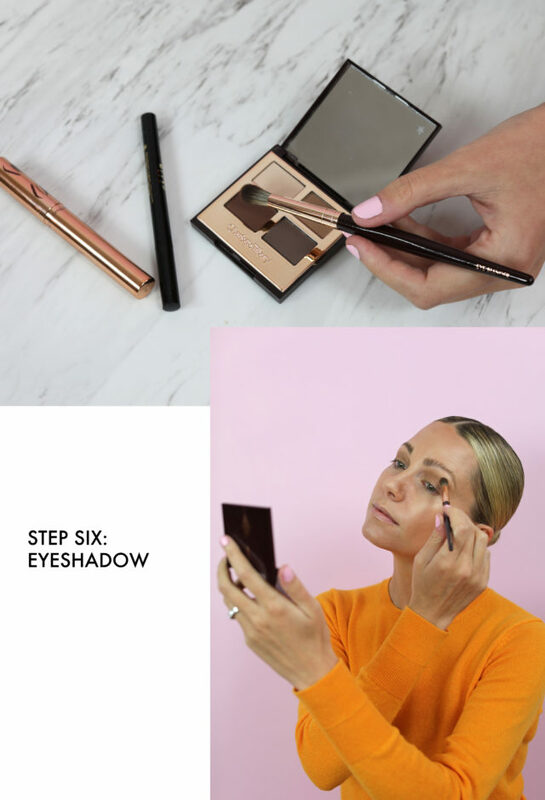 STEP SIX // I create more dimension in my eyes by applying two shades of shadow from the Charlotte Tilbury Luxury Palette (shade ‘the sophisticate). I apply the lightest shade all over my lids, then using a crease brush, apply the next darkest shade to the creases of my eyelids. Why I love it? I love all of my makeup to reside in more of the brown/tan world vs. anything with red or pink undertones. This palette is a beautiful tan/neutral shade that doesn’t flare too orange (as many tan/brown shadows do) and it also does not have any shimmer. I prefer any shadow I use to be flat or matte. It can be difficult to find the right shade that also doesn’t have any shimmer and shine to it – but this one fits the bill. STEP SEVEN // Next, I get dramatic and add a cat eye. Stila’s Stay All Day Liquid Liner has been a staple for me for the past seven years. The very fine, easy to use marker-tip allows me to quickly and accurately draw on a simple cat eye each morning. Why I love it? It is waterproof, easy to apply, SUPER black in color, and the tip doesn’t become worn or lose its accuracy over time. STEP EIGHT // Add this mascara to help open up the eye and complement my shadow and cat eye! Why I love it? This mascara is super thickening (without lots of clumps) and lengthens nicely. It stays on amazingly well throughout the day and never flakes off! STEP NINE // If you have been following me for a number of years you know Stila Stay All Day Liquid Lipstick is my FAVORITE. While living in SF, and through my early days in NYC, I constantly wore Beso but over the past few years I’ve switched it up and Baci has been my newest go-to! Why I love it? It is a liquid lipstick that goes on easy and dries matte. If you do not like having anything dry/matte on your lips this product probably isn’t for you. It stays on all day – even through meals – and is simply an incredible formula overall. STEP TEN // The final step is to set it all! I use Urban Decay All-Nighter to set my final look. From about a foot away from my face, I spray 4-5 times in a simple T motion. Why I love it? For the price, it is the best setting formula I have found. I works like a charm and isn’t oily or sticky. And drumroll…HERE IS MY FACE ALL DONE! Nordstrom has long been my one-stop shop for all of my favorite beauty and fragrance items! Their incredible customer service extends to these categories in so many fun and creative ways. For example, you can chat with beauty experts and check out step-by-step video tutorials online, or enjoy a suite of complimentary in-store services like free makeup lessons, fragrance consultations, and my favorite, complimentary samples! Check out all of their amazing beauty services here. Thank you to Nordstrom and ShopStyle for partnering on this post! You should do more beauty posts! You’re so creative! Awww you look so cute and adorable in your photos, such a delightful post, love ♥️it! I see your beauty routine works very well as your skin and your appearence is very beautiful! Such a lovely Make-Up Look! You look stunning! Love your makeup!! It looks amazing! Thanks for sharing your routine. You always look lovely. Hi! I’d love to know your hair routine. Do you get highlights or all over color? Or are you just lucky and have naturally blonde hair? What is your go-to daytime hair routine? Do you wash every day? Is your hair thick or fine? Sorry – as a fellow blondie – I’m always curious about ladies with great coiffs! I heard of Charlotte Tilbury, but never tried it yet! Really curious now! I always love watching/reading other girls beauty routines 🙂 Always brings so much inspiration to take better care of my skin and look into new products to buy! It’s so great to finally see that beautiful face of yours! 🙂 One question: Who makes the brushes in the photos? I think this is the first beauty post that I’ve seen you do. Amazing step-by-step details! Your skin is glowing!! Love that Charlotte Tilbury eye palette — I use it every single day! Thank you so much for sharing this post. I so appreciate knowing what to try!